This site offers researchers a source of information on the initial transfer of land titles from the Federal government to individuals in Van Buren County Iowa. Federal land records document only the first transfer of land from the United States to another party. Records of later land transactions may be found in county or state records. Public land was disposed of by the authority of many acts of Congress - sale, homesteads, military warrants for military service, timber culture, mining, etc. One of the primary purposes of these public land laws was to encourage people from the East to move West. In the early 1800's people could buy public land for $1.25 an acre. 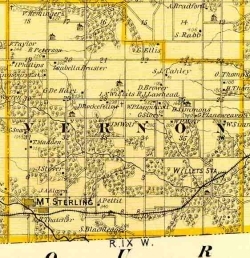 The primary Land Office for this area was Burlington but transactions also took place out of the Fairfield office and Fort Des Moines. Database Programming by Rich Lowe Jr.